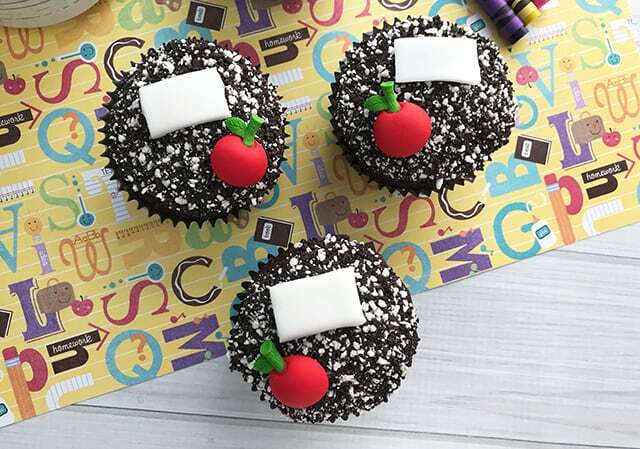 Get your kids ready for school with these adorable back to school cupcakes that look like composition notebooks. 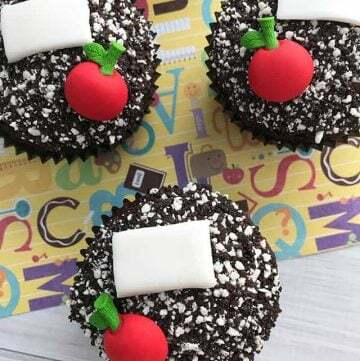 They’re made with a chocolate cake mix, homemade chocolate frosting, and topped with cookies and creme crunch, white fondant, and an apple icing decoration. It’s August and I know a lot of kids are getting ready to go back to school. My soon-to-be 2nd grader won’t be back in school until September, but I know my niece and nephews will be heading back in a week or two. If you’re a stay-at-home mom, I bet you’re a little excited to get those kids back into school. Lucian’s an only child and gets bored. Luckily, we just had a yard sale and he made enough money to buy a couple new Jurassic World Lego sets. I’m hoping that will keep him occupied for a couple of weeks at least. I was shopping for school supplies off the long list we need to get for Lucian this year and was inspired to make some composition notebook cupcakes. 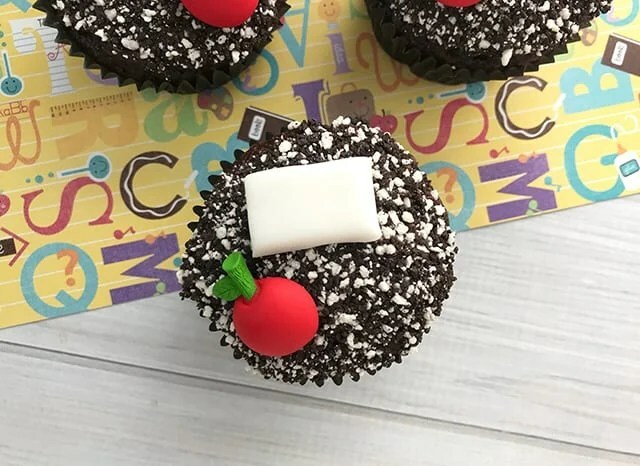 I think what really makes these chocolate cupcakes are the apple icing decorations which are actually supposed to be cherries. Shhhh. They look like apples to me. Are you wondering what’s underneath the Wilton cookies and creme crunch topping? It’s a chocolate frosting that’s homemade. I don’t know about you, but any cake mix cake is made better by a delicious homemade frosting. My son’s teacher fell in love with my frosting when I sent in cupcakes for his birthday last year. 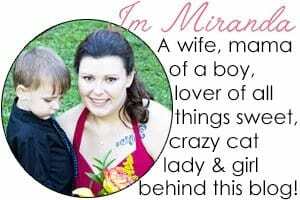 She made me blush she was bragging so much at tee ball practice. I love how easy it is to make American frosting. You basically add it all in the bowl and beat until it’s whipped. That’s what we’ll be doing here. Add your butter, powdered sugar, cocoa powder and heavy cream into the bowl and beat with a hand mixer. After it all comes together, beat for an additional 1 to 2 minutes until it has a whipped consistency. Then pipe a nice rounded pile of frosting using a large straight tip. I used the Wilton 1A tip. You can also use an ateco coupler if you don’t have a large round tip. I used an off-set spatula and flattened out any extra lumps and bumps before dipping it into the crunch sprinkles. Save a little frosting to pop on the back of the fondant rectangle. Don’t like fondant? Use candy melts instead. Melt the candy melts and in the microwave and place it in a sandwich bag. Cut a small hole in the corner of the sandwich bag and pipe small rectangles on a piece of wax paper. If you need to, draw up a sheet of rectangles and place them under the wax paper for a template. Flip the candies over so the smooth side is facing up. Add a little frosting and pop it on the cupcakes. Finish with that apple decoration. 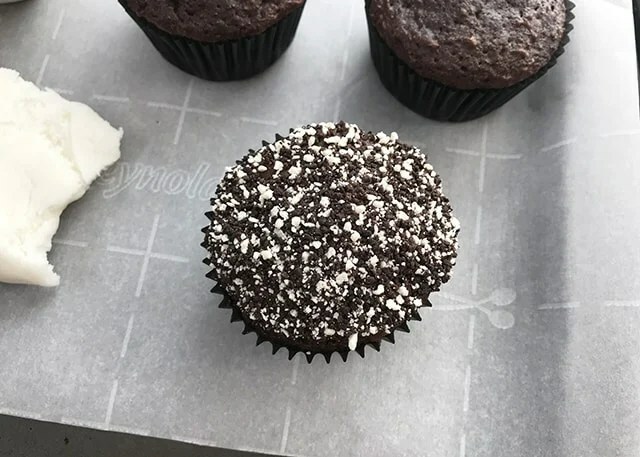 Don’t forget to add a little frosting on the back of that too before putting it on the cupcake. Don’t want to use a cake mix? Try out the chocolate cake from I used for my hot dog cupcakes. 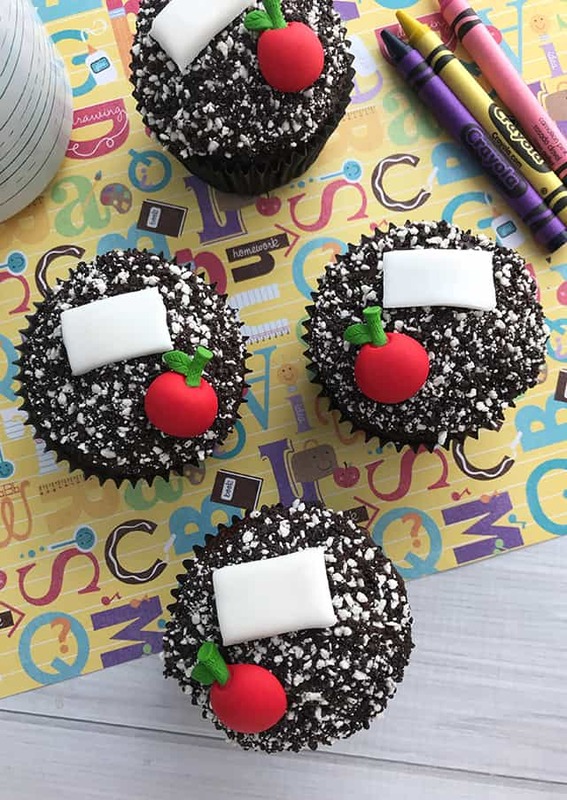 Get your kids ready for school with these adorable back to school cupcakes that look like composition notebooks. 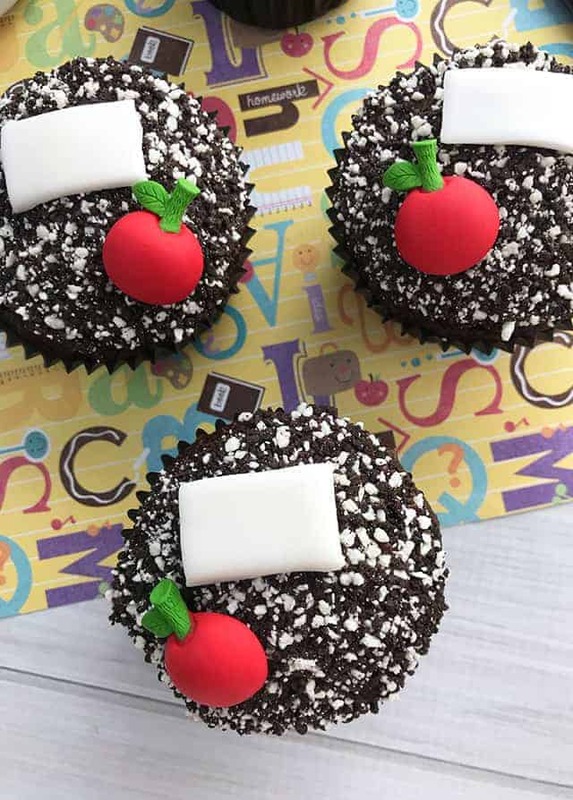 They're made with a chocolate cake mix, homemade chocolate frosting, and topped with cookies and creme crunch, white fondant, and an apple icing decoration. Preheat the oven to 350 degrees. Line a cupcake tin with the black cupcake liners. Combine the chocolate cake mix, eggs, oil and water. Fill each cupcake cavity two-thirds full. Bake 18-20 minutes or until done. Insert a toothpick around 18 minutes and it comes out clean, the cupcakes are done. In a mixing bowl, add in the butter, powdered sugar, cocoa powder, and heavy cream. Beat with a hand mixer on medium until most of the powdered sugar is worked in. Turn hand mixer to high and beat until 1 to 2 minutes until the frosting is light and fluffy. Add the frosting into a piping bag fitted with a large round tip. I used the Wilton 1A tip. Using an off-set spatula, flatten the top of the mound of frosting. Dip each frosted cupcake into the cookies and creme crunch sprinkles. Take a small handful of white fondant and gently roll out using a rolling pin. If the fondant sticks, use a little bit of powdered sugar to help make it easier to work with. 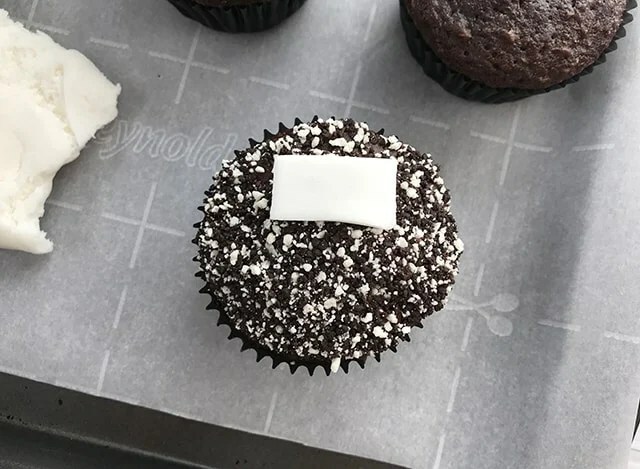 Once the fondant is rolled to about 1/8" thick, use a sharp paring knife to cut out rectangles to put on top of each cupcake. Using the leftover chocolate frosting, add a little frosting to the back of the fondant rectangles and apple icing decorations. These are soooo cool! I love all the little details. The top reminds me the chocolate version of the strawberry shortcake ice cream bars. Mmm. Hehe. Pinned. Can’t wait to try this!